"A must-read book for all mental health professionals wanting to keep up with today's most important clients...practical, concrete, hands-on details from firsthand experts on ethnic populations." The rich mosaic of racial and ethnic diversity defines our society now more than ever. For students and professional psychologists, this translates into a critical need to address a range of cultural diversity issues, as well as potential biases. Recently, the American Psychological Association (APA) recognized the importance of cultural competence for psychologists through its adoption of its Multicultural Guidelines. Applying those guidelines to real-world practice is both complex and challenging. Only one text brings it all into sharp focus: Strategies for Building Multicultural Competence in Mental Health and Educational Settings. Edited and written by renowned multicultural experts, this informative guide is full of concrete strategies and case examples, all geared toward achieving the goal of culturally competent practice. 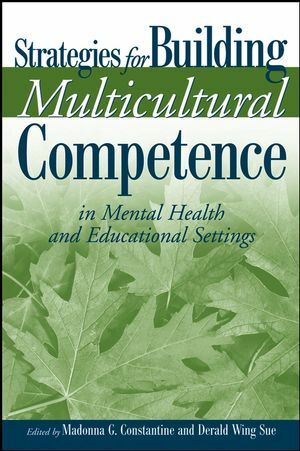 Chapter by chapter, it uses a variety of practice modalities in various settings to help all mental health professionals increase their familiarity and compliance with the APA Multicultural Guidelines. This timely reference also considers building multicultural competence around indigenous healing practices; in clinical supervision contexts; and in culturally sensitive research. Taken together, the book is a much-needed blueprint for making culturally informed decisions, explaining how the multicultural initiatives you implement today can he'p shape the field's future. Madonna G. Constantine, Ph.D., is a Professor of Psychology and Education in the Department of Counseling and Clinical Psychology at Teachers College, Columbia University. She serves as Director of the Teachers College Winter Roundtable on Cultural Psychology and Education and is a highly esteemed researcher in the area of multicultural counseling. Derald Wing Sue, Ph.D., is a Professor of Psychology and Education in the Department of Counseling and Clinical Psychology at Teachers College, Columbia University. He is the author of several books related to multicultural counseling, including Counseling the Culturally Diverse, Fourth Edition (with David Sue), and several undergraduate texts on abnormal psycohlogy (with David and Stanley Sue). Part I: Overview of the American Psychological Association’s Multicultural Guidelines: Implications for Multicultural Competence. 1 The American Psychological Association’s Guidelines on Multicultural Education, Training, Research, Practice, and Organizational Psychology: Initial Development and Summary (Madonna G. Constantine and Derald Wing Sue). Part II: Applying the Multicultural Guidelines in Clinical Practice. 2 Culturally Sensitive Assessment, Diagnosis, and Guidelines (Gargi Roysircar). 3 Using the Multicultural Guidelines in Individual and Group Counseling Situations (Edward A. Delgado-Romero, Jessica Barfield, Benetta Fairley, and Rebecca S. Martínez). 4 Using the Multicultural Guidelines in Couples and Family Counseling (George V. Gushue, David E. Greenan, and Sarah J. Brazaitis). 5 Applying the Multicultural Guidelines to Career Counseling with People of Color (Lisa Y. Flores, Yi-Jiun Lin, and Yu-Ping Huang). 6 Independent Practice Settings and the Multicultural Guidelines (Melba J. T. Vasquez). 7 Building Multicultural Competence around Indigenous Healing Practices (Linda James Myers, Ezemenari M. Obasi, Monica Jefferson, Michelle Anderson, Tamara Godfrey, and Jason Purnell). Part III: Applying the Multicultural Guidelines to Educational, Training, and Organizational Settings. 8 Academic Mental Health Training Settings and the Multicultural Guidelines (Jeffery Scott Mio). 9 Multicultural Competencies in Clinic and Hospital Settings (Jairo N. Fuertes, Alexa Mislowack, and Sharon Mintz). 10 Using the Multicultural Guidelines in College Counseling Centers (Ruperto M. Perez, Mary A. Fukuyama, and Nancy C. Coleman). 11 Application of the Multicultural Guidelines to Psychologists Working in Elementary and Secondary Schools (Mai M. Kindaichi and Madonna G. Constantine). 12 Building Multicultural Competence in Clinical Supervision (Marie L. Miville, Dinelia Rosa, and Madonna G. Constantine). 13 Effective Multicultural Consultation and Organizational Development (Derald Wing Sue and Madonna G. Constantine). Part IV: The Multicultural Guidelines and Culturally Sensitive Research. 14 Culturally Sensitive Research: Where Have We Gone Wrong and What Do We Need to Do Now? (Janet Chang and Stanley Sue). 15 Conducting Quantitative Research in a Cultural Context: Practical Applications for Research with Ethnic Minority Populations (Shawn O. Utsey, Rheeda L. Walker, and Naa Oyo A. Kwate). 16 Conducting Culturally Sensitive Qualitative Research (Devika Dibya Choudhuri). 17 Future Considerations for Fostering Multicultural Competence in Mental Health and Educational Settings: Social Justice Implications (Sally M. Hage).